What if GSA took a page from OGC's playbook? Recently the UK's version of GSA put a moratorium on leases. That made me wonder, "what would happen in GSA did something similar?". 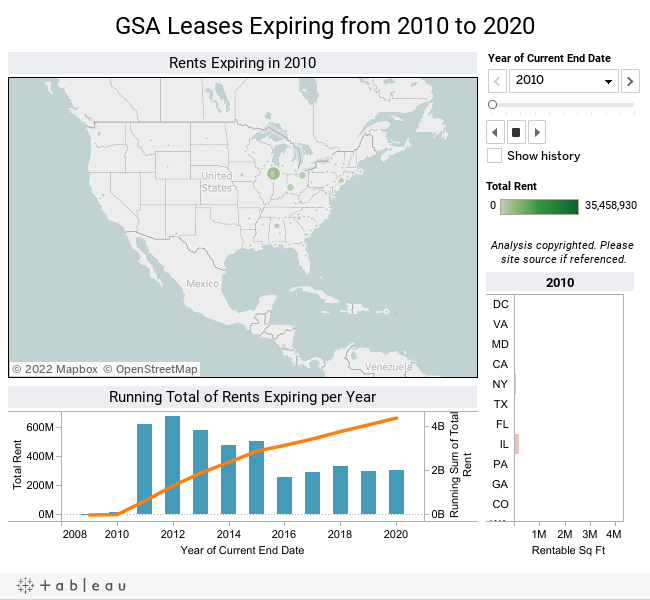 I went to GSA's website and downloaded publicly-available data on leases. GSA's current lease vs. owned portfolio is tilted towards leases at ~55% of the total portfolio. Let's assume for a moment that GSA were to put a moratorium on renewing expiring leases, and instead directed requesting agencies to implement alternative workplace strategies and relocate to Federally owned space as appropriate. This scenario does not consider employee future growth which can range from 5-15% per agency and further drive the need for space. By simply not renewing expiring leases, GSA can cut more than $2 billion in rents by 2014! Check out the data analysis below and explore this scenario for yourself. Newer PostThe U.S. Government wants to dump supply in a weak commercial real estate market.